Applications for this tool include SMT parts, metal parts, plastic parts or any item having a smooth-nonporous-surface that the rubber vacuum tweezer tip can seal against. This tool can be used with any of our rubber vacuum cups ranging in size from 3/32" (2.38mm) to 3/4" (19.05mm) in diameter. Use the larger cups to pick up larger and heavier parts. For better precision in part placement see our PEN-VAC or PEN-VAC PRO-Series self contained vacuum pens. 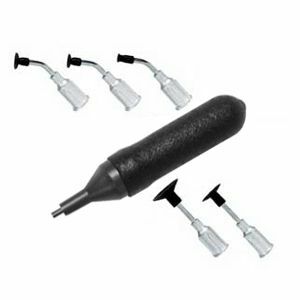 Purchase a Virtual Industries HV-KIT-II-B HANDI-VAC KIT Today.